In late 19th Century to early 20th Century, Scandinavian Peninsula was a place of rolling hills widely covered with forests and lakes. People go through these forests to other towns or villages. Living in such environment and walk through forests need to know how to use map and compass. Local military trained army with skills of map reading and compass. This became the beginning of orienteering. In 1918, scout leader Major Ernst Killander organised a treasure hunting game, aroused the interest of many participation. This is the earlier format of orienteering. The game is easy to be organised. It enhances navigational skills and use of map, it also promotes courage, strong spirit to face challenges, and mental ability and physical fitness. Unlike other game sport which requires expensive facilities and equipment, development orienteering is full of entertainment and practicality, it became an important aspect of military and later very popular to public. Orienteering is a high degree of field sports to play to their wisdom and physical. Athletes is regulated by individual orientation technology, map reading skills and compass use, and to think for themselves to judge, in the unfamiliar wilderness environment, find the tournament pre-placement of each control point. The location of the control point is pre-painted on the map when athletes reach the control point can be found in the sign of the control point, which is under the banner of the three sides of feet (30cm X 30cm) divided into white and orange-red, diagonal, control point number printed in the top of the white position, athletes password folder attached to the sign in the appropriate location on control card punch for Hutchison, to prove that he had arrived there. But the line between control points and control points but not limited to, usually the route between two points there will be two or more choice, look for the completion of the required control point of arrival, must return to the end report. Orienteering is a sport that use map and compass to find a designated area in an unfamiliar environment. It is an outdoor sport that develop one's mental ability and physical fitness. Athlete use their own orienteering techniques, map reading skills us of compass and personal judgement, use shortest time to find control points which are placed in an unfamiliar natural environment. Locations of control points are marked with circles on the map. When athlete arrive a control point, he/she can find a three sided control markers of size 30cm x 30cm, diagonally split into a upper white triangle and a lower orange triangle. Control point code is marked at the upper corner on the white triangle. Athlete punch on the control card with the punch hanged at the control marker or place an electronic timing chip on an electronic timing sensor to proof that the athlete has arrived the control point. Route between two control points are not marked. Usually there are two or more routes for choose. After visited all control points, all must return to the finish. International Orienteering Federation (IOF) defines orienteering as a sport that combines both a physical and a mental element. The basic idea in orienteering is to proceed from course start to finish by visiting a number of control points in a predetermined order with the help of map and compass. In order to choose the best possible route, orienteers look at the characteristics of the terrain, and the winner is determined by the fastest time to complete the course. What is unique to orienteering is that an orienteer must navigate and make quick decisions while running at high speed. Orienteering suitable for people of different age and gender. The youngest age group in orienteering activity is age 10. The eldest age group is age 85. Open class has no age limit. In general, there are over 20 classes defined by age and gender. in recent years, Trail Orienteering accept people with physical inability and world championship. Other than classify by age group, large competition also separate open class into different sub-classes with different level of difficulties for people of different experiences. Orienteering is a sport test one's physical fitness and mental skill, therefore all formal competitions are compete in solo. In normal activities, it is common to have pair team or beginner class, family class, parent and kid class or team class etc. Orienteering competition in Hong Kong usually attract several hundred participants, the largest event in Hong Kong in recent years is the annual Médecins Sans Frontières (MSF) Orienteering Competition. There were 3000 participants took part in 2013. The world largest orienteering event is the annual O-Ringen in Sweden, with over twenty thousand participants. Orienteering has its special elements that athlete moving forward with his/her own ability, when they arrive at a control point, they receive a reward of excitement and an extra satisfaction, psychologically it let participant get the most wanted stimulation. It is an enjoyment for people who work in city can be alone in a quite place of natural scenic environment, and this probably is one of the many reasons that so many orienteers practice orienteering regularly. International Orienteering Federation (IOF) has four orienteering disciplines. These are Foot Orienteering, Ski Orienteering, Mountain Bike Orienteering and Trial Orienteering. Each year IOF and her national federations organise world championships, international competitions and local competitions in these four disciplines. Foot orienteering is an endurance sport by walking or running, which involves a huge mental element and concentration. There is no marked route – the orienteer must navigate the route and direction by themselves with map and compass to visit many designated controls fast. Traditional orienteering run in forest. Orienteer moving forward cross country by running through forest terrain, wild land, mountain and river and obstacles. Normal long distance competition take 60-90 minutes to complete, middle distance competition needs 25-40 minutes to finish and sprint event, a short distance run in high speed, will finish in about 15 minutes. It is common nowadays with sprint competition take place in town park or at side streets of small town, which allow public spectators and media to have close view of running athlete. It is also an attractive programme for community promotion. Foot orienteering became a recognised Olympic sport in 1977. Ski Orienteering is similar to Foot Orienteering. It is only conduct in winter period by cross county skiing on prepared ski tracks with navigation on map. Ski Orienteering also require huge demand on physical fitness, endurance, navigational skill and route choice decision, of course the skiing techniques and ability. Ski Orienteering also compete for athlete who visit all controls in the shortest time to be the winner. Ski Orienteering course is set up in country side which may use the ski tracks for cross country skiing or biathlon. ski Orienteering do not allow skiing outside the ski tracks. Ski orienteers navigate while skiing with the map place on a map board hang in front of the chest. Ski tracks show on map in green colour dash line, which is different from map symbol for foot path in foot orienteering. Ski Orienteering start in1909s. Now, Ski Orienteering mostly held in northern countries. Ski Orienteering was organised at 2011 Asian Winter Games for the first time. Hong Kong has no ski orienteering and so can not take part in it. Ski Orienteering will probable be the earliest orienteering discipline to be entered into Winter Olympic Games. Mountain Bike Orienteering held on forest paths or tracks. Similar to Ski Orienteering, athlete and his/her bike can only ride on roads or tracks. To protect the nature, bike is not allowed in forest. Mountain Bike Orienteering equipment include map for orienteering, but in smaller scale, compass and timing chip, and also a mountain bike, safety helmet, map rack and tools. Good bike handling and ability to cope with steep slopes both up and down is an absolute must for a mountain bike orienteer athlete. Map is usually put on a map rack installed on the handle bar of the bike. A bike orienteer needs to read map during riding, which is not a easy task for normal biker. 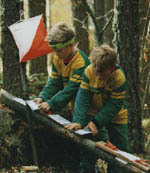 Mountain Bike Orienteering start in late 1980s. There are world championship in each year. HKOC had organised two bike orienteering competitions in 1980s at village areas in New Territories. The first bike orienteering competition was held in 1985 held at Fanling with very good responses. With the increase of popularity of mountain biking in recent years, some organisations had organised mountain bike orienteering in Hong Kong in the past few years. Trail Orienteering(Trail O) is a true sport for all. People of different age, gender and with physical disability compete at the same event and with no separate classes. The first World Trail Orienteering Championship was held in Sweden in 2004, in which paralympic athlete compete with normal athlete. Map for Trail O is different from foot orienteering, it only describe the terrain features near the control points. Athlete walk along designated path, visit decision point of all controls in sequence, with the control markers placed in the forest terrain at a distance not too far from the path. The competition has time limit, overtime will be penalised. There will have 5 control markers place on the terrain. According to the map information and the control description, athlete decide which control marker is the correct one. Occasionally, there is a "none of these are correct" scenario. Decision of the correct control marker shall be decided and marked on an answer sheet at a decision point by the path, and decide which is the correct one. The control marker at the most left hand side is A, in this order for B, C, D and the one at the most right hand side is E. There is also case of no correct answer, it represent by a letter Z. There are timed controls at Trail O competition to distinguish winner on competitor with the same score. Time limit is one minute. One point for a correct answer, zero point for incorrect answer and also add 60 seconds as penalty. Can not provide an answer will be zero point and add 120 seconds penalty. The result ladder list out in according to points and time. Highest points and less time has a higher position. Trail O competition test for techniques, tactics, map reading skills and experience. A correct answer to determine who can win. A Hong Kong athlete had defeated many experience athlete and won a Japan Trail O competition some years ago. Japan is strong in Trail O and had won the bronze medal twice at world championship. It is the only Asian country had won medal in world championship. HKOC had organised Trail O competition in 2006 and 2012, is one of the leading orienteering club in Trail Orienteering. HKOC established a Trail O Committee in February 2013 focus on trail orienteering development and promotion. Temp O is a sprint type Trail Orienteering which compete for shortest time. It is to compete for the shortest time to decide which control markers place on the terrain is the correct one among all control markers as the marked circle in the control point on the map. Athlete may walk or jog along path between two control points, which is not timed. This demand an alternative fast - slow - fast - slow competition tempo mental test. This is what it called "TEMP O". Temp O and Trail O are a very good training on precise map reading, is specially essential training for foot orienteering athlete to read and describe terrain relief with contour lines. Cross Country Orienteering is the main type of orienteering competition. International and the local use Cross Country Orienteering Events for the standard scoring and championship. Athletes must rely on the map provided. The map will be printed with a number of control points and direction lines to direct the specified order of the course. Athlete visit all controls one by one in sequence and report to the finish point. To complete the entire competition to take the shortest for the winning. Athlete who are not running is required sequence will be disqualified. There are many controls are placed in the competition area. Each control is assigned with a score. The score at a control is assigned by its distance, difficulty and connection with other controls nearby. Within a limited time, athlete visits as many controls as possible, with test of their skills, experience and physical fitness. Overtime will be penalised with certain score. Athlete do not need to visit the controls in order. score the highest points will be the winner. In case of athletes have the same score, athlete has the shortest time win. Typically, athlete can not visit all the controls within the limited and get all score. Relay is usually compete in teams of 3-4 legs. Competition course are in a few sections with each member to run for a section and come back to change over area in the shortest time. Leg change by a hand touch. The total running time of all team members determine the team result. The fastest total time team win the relay competition. There is a relay competition in each year in Hong Kong. It bring all orienteering clubs and teams to compete and also a social event for all. The most famous relay event in the world is the 10 Mila (Tiomila in Swedish) in Sweden with 10 relay legs with both men and woman and compete in 24 hours. Another famous Valio-Jukola relay events in Finland attract several thousand men and women teams of over 15,000 participants to complete round the clock. Team Orienteering compete in team base. Each team has 3-4 members. It compete in cross country types with certain "Compulsory Control Points" must be visited and some "Free Control Points" are free to visit. Each team member shall compete in shortest time and return to finish. 1.1 "Compulsory Controls" are visit in sequence as in individual cross country orienteering. 1.2 Other "Free Controls" spread in the area are visit as in a score event. 1.3 The first control to visit for each member shall be the first control of "Compulsory Control", the last control to visit shall be the last "Compulsory Control". 1.4 Any control visited before the first "Compulsory Control" and the last "Compulsory Control" will not count. 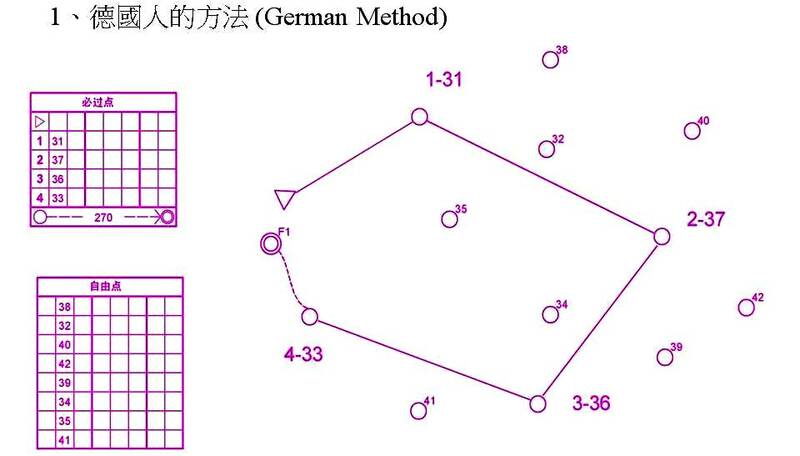 This method similar to German Method. The differences are those "Free Controls" can be visited before or after "Compulsory Control". This method is named after the Harris Event. British army organise this event every year. 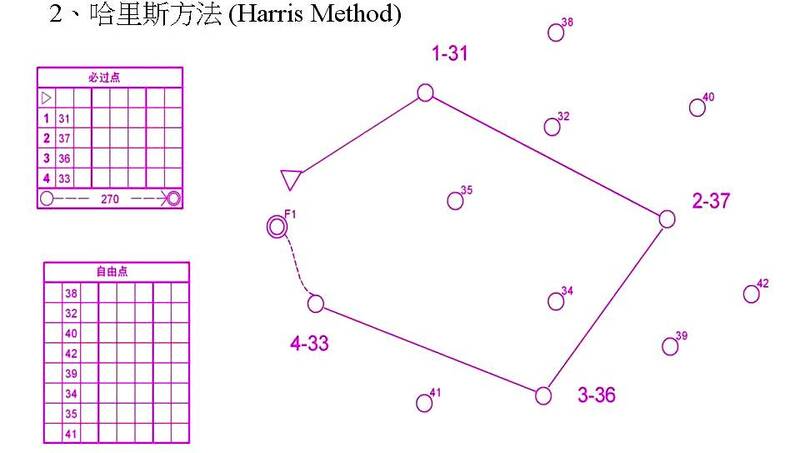 HKOC organised the first Team Orienteering in Hong Kong on 18/12/2011 use the Harris Method format. This method do not require to visit "Compulsory Controls" in sequence. Each member are free to visit all assigned compulsory controls, but the whole team shall visit all "Free Controls". Team Orienteering provide map reading zone. Teams enter into map reading zone will have 2-4 minutes to read map and discuss with members on route. It provide marking pen for mark route and controls sharing on map. When start clock count to 5 seconds before start, all members shall leave the map reading zone. At start time all members shall leave the start area. Time of the last member of a team return to finish is to be counted for the team finish time. 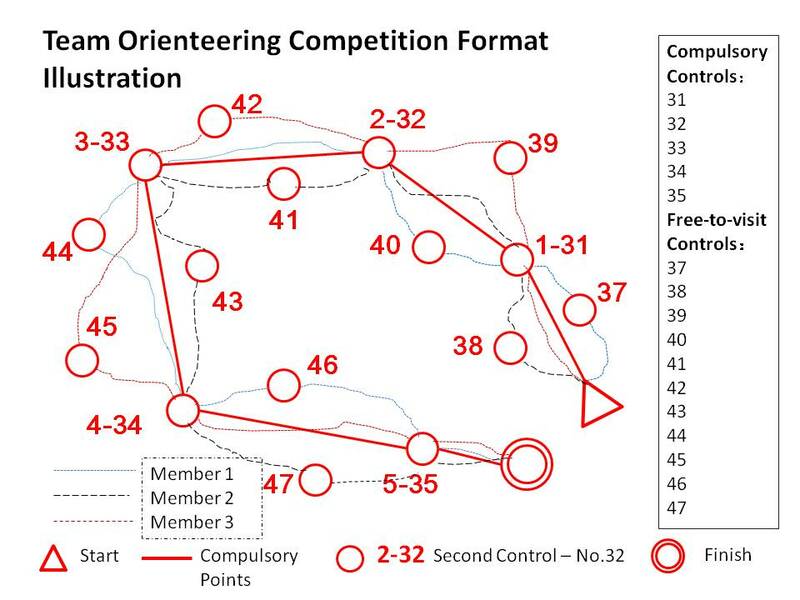 The critical part of excellent result in Team Orienteering is on the reasonable sharing of "Free Controls" in according to the physical fitness and skills of members and selection of best route to finish all designated "Compulsory Controls" and "Free Controls", and with all members return to finish at the same time with all controls visited. The distribution of "Free Controls" must consider the skill level of each members. There may be occasion where some member has returned to finish and other members are still on the course, or finished member return to the competition area to help other members in those "Free Controls". Team Orienteering is truly test a team spirit in orienteering, it also increase popularity of orienteering and provide a new wave of competition. HKOC is the first orienteering organisation organises Team Orienteering in Hong Kong. HKOC organises Team Orienteering every year. Micro O start in Russia. It also reformed by China as "100m Orienteering" which is very popular in China. Micro O held in an area of size of about a football pitch. The area us usually a open land, tree planting area or sport ground with wide visibility, it allow spectators to watch and cheer up. Over several ten control points are placed on nature obstacles, man made features in the competition area, require competitors run swiftly to visit controls in a designated sequence. The course is usually can finish in within 10 minutes. There will have some fake control markers places in the area which is very easy to have wrong punch. Electronic timing system is used to record the exact time and controls that have been visited. It is usually with several competitors compete in each match and each competitor may have different control points on the route. The fastest competitor is the winner. Therefore, this require a fast map reading skill when sprinting in the course, and extreme psychological test under the pressure of viewing and cheering by spectators. Athletes with good cognitive ability, good body coordination and fast running speed have advantage in Micro O.
HKOC use Mirco O as a training for fast map reading skill. It is common in Europe arrange cross country orienteering competition with Micro O in certain sectionon the course. Micro o do not need high physical demand and only compete in very short time, it is easy to organise in school campus and for different age group, also convenience to have commentator at the competition to increase competition atmosphere. Other than the types of orienteering listed above, orienteering can also be assisted by different transportation tools such as bike or horse riding, orienteering on water usually on canoe or raft. Each year, Hong Kong Canoe Union organise canoe orienteering. Mainland China and some countries organise multi-sports orienteering involve different types of orienteering such as foot orienteering, mountain bike orienteering, rafting orienteering and micro O etc. It test athlete's all round skills, physical fitness, endurance and orienteering techniques. Competition may take 4-5 hours, which attract many adventure sport athletes to take part. Orienteering can also be organised at night time, which increase excitement and require better orienteering skills. HKOC organise night orienteering competition in each year. In recent years, long distance orienteering competition is very common, such as mountain marathon and rogaining. Competition time is in a several hours to 24 hours. Mountain Marathon is in cross country format while Rogaining is in score orienteering type. Rogaining sport has an International Rogaining Federation. Orienteering has its distinct interesting element and competition format and it is very good to lead participant to an unfamiliar location. There are many organisations organise City Orienteering in recent years to promote community facilities or attractions. City Orienteering can use simple street map or special city orienteering map to bring in participants from other sectors into orienteering.